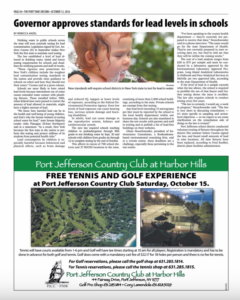 The Port Times Record, pictured, Times of Huntington-Northport, Times of Middle Country, Times of Smithtown and Village Beacon Record published this piece in print on Oct. 13, 2016. Drinking water in public schools across the state will soon conclude testing for lead contamination. Legislation signed by Gov. Andrew Cuomo (D) in September makes New York the first state to mandate such testing. The law established a level of lead allowed in drinking water, initial and future testing requirements for schools and deadlines for notifying parents and staff of results. “These rigorous new protections for New York’s children include the toughest lead contamination testing standards in the nation and provide clear guidance to schools on when and how they should test their water,” Cuomo said in a press release. Schools are more likely to have raised lead levels because intermittent use of water causes extended water contact with plumbing fixtures. Those installed before 1986, when federal laws were passed to restrict the amount of lead allowed in materials, might have a higher amount of lead. Lead consumption by children is especially harmful because behavioral and physical effects, such as brain damage and reduced IQ, happen at lower levels of exposure, according to the federal Environmental Protection Agency. Even low levels of lead exposure can cause hearing loss, nervous system damage and learning disabilities. 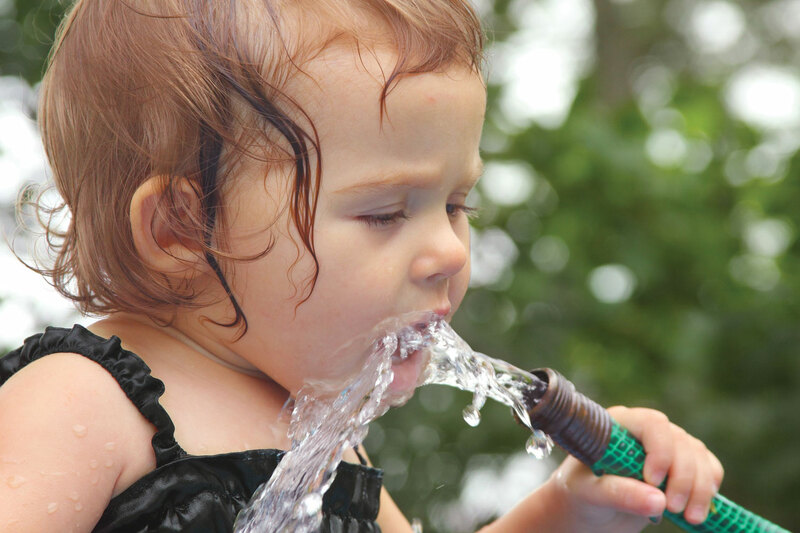 In adults, lead can cause damage to the reproductive system, kidneys and cardiovascular system. The new law required schools teaching children in prekindergarten through fifth grade to test drinking water by Sept. 30 and schools with children from grades six through 12 to complete testing by the end of October. This affects in excess of 700 school districts and 37 BOCES locations in the state, consisting of more than 5,000 school buildings, according to the state. Private schools are exempt from this testing. New standards will require school districts in New York state to test for lead in water. Times Beacon Record News Media file photo. Any lead level exceeding 15 micrograms per liter must be reported by the school to the local health department within one business day. Schools are also mandated to share the test results with parents and staff in writing and to publish a list of lead-free buildings on their websites. Glenn Neuschwender, president of Enviroscience Consultants, a Ronkonkoma-based environmental consulting firm, said to a certain extent, these deadlines are a challenge, especially those pertaining to the test results. The cost of a lead analysis ranges from $20 to $75 per sample and must be conducted by a laboratory approved by the Environmental Laboratory Approval Program. Long Island Analytical Laboratories in Holbrook and Pace Analytical Services in Melville are two approved labs, according to the state Department of Health. If the level of lead in a sample exceeds what the law allows, the school is required to prohibit the use of that faucet until further testing shows the issue is rectified. The law also requires schools to conduct testing every five years. 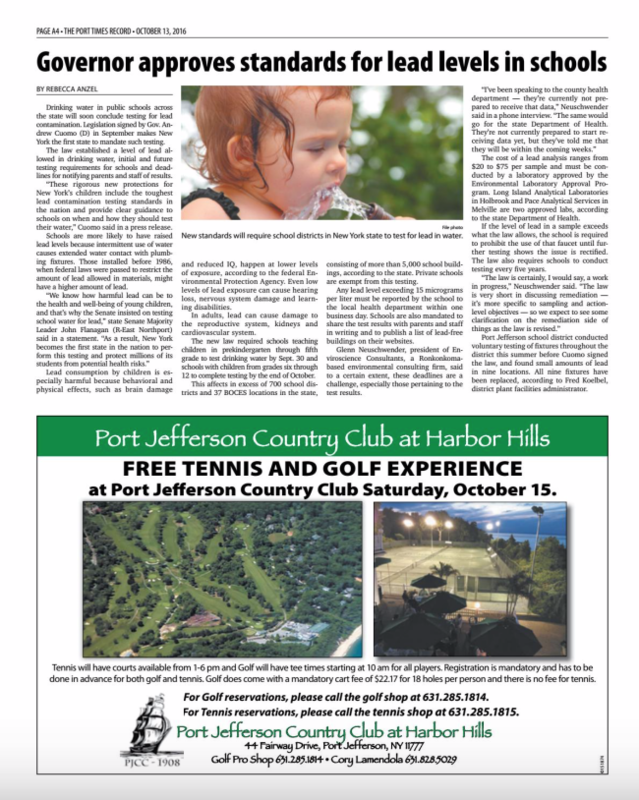 Port Jefferson school district conducted voluntary testing of fixtures throughout the district this summer before Cuomo signed the law, and found small amounts of lead in nine locations. All nine fixtures have been replaced, according to Fred Koelbel, district plant facilities administrator.